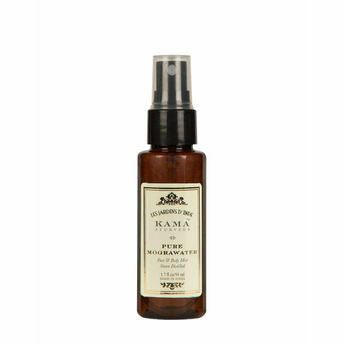 Face & Body Mist Steam distilled from hand-picked Indian Mogra (Jasmine). This pure mogra water is an ancient recipe for skin hydration, which balances dry, mature and sensitive skin. Its anti-inflammatory properties relieve stressed skin while it calms the nerves and alleviates tension to uplift the mood. It is a skin care treatment for ph balancing and also helps in reduction of fine lines and pigmentation. Mogra's sweet fragrance is clarifying and refreshing to start or finish, a long day. The steam distillation process used to create this wonderful water ensures a high level of hygiene and purity. Explore the entire range of Toners & Mists available on Nykaa. Shop more Kama Ayurveda products here.You can browse through the complete world of Kama Ayurveda Toners & Mists .